In recent years, managerial concerns surrounding organizational transparency have become extremely important at all levels of industry and government. So important in fact, that most sensational news stories in recent years - namely Edward Snowden, Wikileaks, the Sony Hack, Bradley Manning - are issues of organizational transparency. For individuals who defend transparency, we even have a name that has acquired the show-stopping power of words like "terrorist" and "hero," or "whistleblower." But there is a strong argument that aviation safety transparency could expose exploitable safety "holes"
reporting observed behavior that is potentially unsafe. Before we look specifically at transparency, let's refresh ourselves on the fundamental model underlying aviation safety management. What Does Aviation Safety Culture Look Like? As many of you are probably already well aware, in 1990 professor James T. Reason published Human Error, which analyzed primary factors in workplace accidents, and provided a framework for understanding how those accidents occurred. Another way of understanding this model is as the relationship between hazards and accidents. 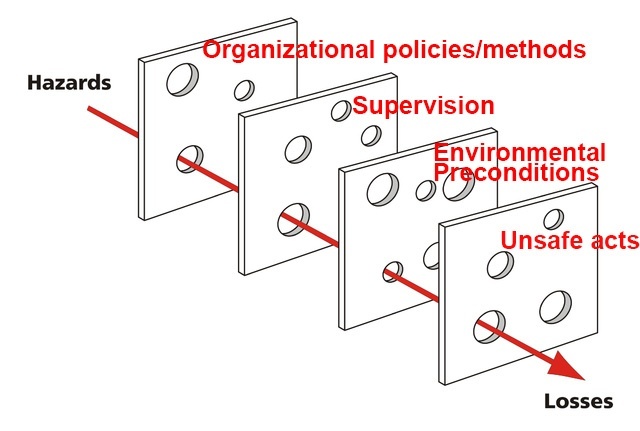 This framework is now widely regarded as the "Swiss Cheese Model." This model is the foundation of understanding the defense layers of aviation safety, among other industries such as cybersecurity. I especially highlight the importance of the last bullet point. Properly administering an aviation SMS with limited resources is the ultimate goal and challenge of safety managers, and it is vitally linked to the safety transparency in a workplace. Management circumventing policies, practices, etc. intentional violation of aviation or company procedures. While we are on the topic, make sure you non-punitive reporting policy explicitly states what behavior is not protected. Though we may cringe at making certain safety reports public, a transparent work environment will support an extremely high level of employee engagement. But how transparent should a work environment be? Nearly 100% - everything but information that is essentially impossible to release. If a reported issue is affecting any person, in principle it should be available to the general workforce because such a level of transparency promotes safety culture. Let's look at the main reasons why. unintentionally disclosing medical or sensitive employee identification data. 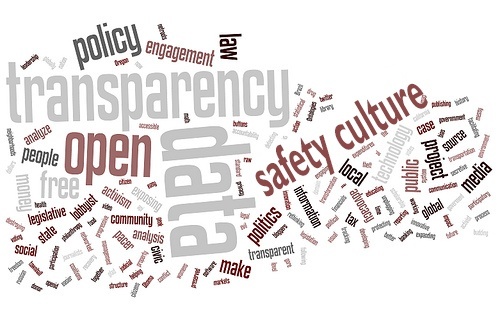 These arguments are generally short-term considerations when discussing an organization's policy of transparency. Timely action must be taken to address the safety risk when hazards are identified. When the workforce is aware of a particular safety issue, then it is actually much less exploitable than if the hazard or safety safety report were kept confidential, namely because no one would be "looking out" for the identified hazard. Traditional safety programs may have managers introduce either new or modified policies and procedures in response to reported safety concerns. Employees may grumble or scratch their heads why "new rules" are being made without understanding the change's nexus or reasoning behind the change. This type of safety culture is not a trusting or transparent safety culture. Then there is a common problem of reporting on friends/coworkers/etc., without fear of retaliation. When coworker's inappropriate behaviors or errors are made public to the remainder of the workforce, there is a chance of giving the reporter a sort of "whistle-blower" status. Threat of retaliation toward the reporter becomes clear both to the reporter and to management who need to effectively manage a "harmonious, productive workplace." This issue is tougher to arrive at a clear-cut, definitive answer. In many safety cultures, this can be a tough hurdle to overcome. The fact is that many work environments struggle with genuine non-punitive reporting cultures, and suffer from lack of safety reporting because of it. This becomes more evident as we work with aviation service providers in Southeast Asia and Latin America. Nobody wants to be seen or labeled as "The Rat." "looking out for the safety of the workplace." Engineering controls (redesign the system in response to detected behavior). Attaining transparency in aviation SMS is a fundamental precept of making operating environments a "safe place to work" - of helping keep a workplace proactive rather than the place where one "tattle-tales," and becomes "The Snitch." "No secrets" is the foundation of trust in any relationship. It creates better lines of communication and removes barriers between management and the general workforce. "Transparency at all levels of the workplace promotes a just reporting culture"
A just reporting culture is a healthy safety culture, and is a foremost line of resistance in preventing accidents, or "losses." Like I said, implementing a rule of transparency is not easy, especially when it comes to embarrassing or sensitive issues - with such issues the instinct is strict confidentiality. But I would like you to look very hard at such issues and decide if confidentiality is absolutely necessary. In most cases upholding transparency will be healthier for the safety culture of your workplace, and the success of your SMS. Transparency starts at the top. Strong defenses mean less "holes in our cheese"
It's a revolving door. But the main point is that Transparency leads to better relationships and therefore lines of defense. When new safety issues arise that have not been properly mitigated, or when workers practice unsafe acts, there will be many other people standing between the hazard and "The Accident." We know with certainty that "The Accident" is coming. We do not know "when" The Accident is coming or "where." But we do know "why." developing or strengthening weak controls. When safety concerns are not reported, there are fewer opportunities to review risk controls and improve underlying processes. Furthermore, I think we can all agree that working in an environment where you trust and feel trusted is a pretty good spot to be. learn what is currently being done to address their safety concern in real time without long waits. When your aviation SMS lacks an efficient safety reporting system that is integrated with a solid risk management system designed specifically for the aviation industry, your safety reporting culture will never flourish. Are you having troubles with safety culture and safety reporting? We can help. Since 2007, we have been providing the best aviation SMS database software on the market. Each day, I become more confident that SMS Pro is the best database software because our clients have been repeating this same story for years. I'm beginning to believe them. The story is always the same. What is funny to me is that aviation safety mangers compare SMS Pro to the competitors using "automobiles" instead of aircraft. They call SMS Pro the "Cadillac" or "Rolls Royce" of SMS databases. I'm not saying anything bad about our competitors. But SMS Pro price is not out of line and is often less expensive than the competitors. We want to be your SMS Partner. SMS Pro impresses SMS auditors. Published November 2015. Last updated February 2019.